Would Martin Luther King Have Supported Charter Schools? Civil rights legend's closest aide, Dr. Wyatt Tee Walker, gives RCL exclusive insight. Would Dr. Martin Luther King, Jr., have been a fan of charter schools? Emphatically yes, says his closest aide and fellow civil rights legend, Dr. Wyatt Tee Walker. Dr. Walker, now 87 and living in Virginia, was executive director of the Southern Christian Leadership Conference and Dr. King’s chief of staff during the critical Civil Rights Movement years of 1960 to 1964. Dr. Walker became famous as the “field general” for the Birmingham civil rights campaign in 1963, opposing Sheriff Eugene “Bull” Connor. He also compiled, edited, and named Dr. King’s famous “Letter From a Birmingham Jail.” Dr. Walker was with Dr. King on his March on Washington and when Dr. King collected the Nobel Peace Prize. In 1999, during his tenure at the church, Dr. Walker became a key founder of the first-ever charter school in New York State. This school is now named the Sisulu-Walker Charter School of Harlem in honor of Dr. Walker and of Walter Sisulu, a close ally of Nelson Mandela. It is the only surviving charter school in New York from that first year. In 2016, Sisulu-Walker scored approximately 1.7x higher than the traditional public schools of Harlem/District 5 in English Language Arts (32.4 percent to 19.2 percent) and approximately 2.5x higher in math (48.2 percent to 19.2 percent). Sisulu’s math scores also exceeded New York City and New York State’s math scores, even though the City and State’s student bodies are substantially wealthier than Sisulu-Walker’s. An award-winning book, A Light Shines in Harlem, has been written about Dr. Walker’s work with his co-founders to start the Sisulu-Walker school. The book won the Phillis Wheatley Award for best nonfiction book of the year from the QBR: The Black Book Review and the Harlem Book Fair in 2015. The book was also named as one of the top education books of the year by Harvard University’s EducationNext, called a “must-read” by The Center for Education Reform, and praised as “an incredible story” by The Huffington Post. The book was reissued in paperback this month by publisher Lawrence Hill Books (an imprint of Chicago Review Press). In 1959, while still a young minister in Virginia, I organized and led the first local Prayer Pilgrimage for Public Schools, an event that protested Virginia state officials’ attempts to block public school integration. Forty years after my foray into human rights and the struggle for justice, in 1999, as a senior minister in Harlem, I joined with others as part of another nonviolent revolution and march for justice, forming the first charter public school in the state of New York. This book is a history of that pioneering school and its formation, and of the movement for better public schools for all of America’s children. ….What made me join the charter school movement? The movement for justice, of which I was a frontline participant, taught me the importance of quality education. The congregation in Harlem that I ministered for thirty-seven years chiefly served the children of District Five of the public school system of New York City; a district which had long been judged nonperforming and unable to produce students who were proficient in reading, math, and the sciences. As I worked on other justice issues (housing, employment), I was frustrated that I had no tools to better the school system that served the families of my congregation. Was not the matter of quality education a justice issue also? I became convinced that quality education was the undeniable complement of the struggle that I had given my life to. That’s what led me to dive into the charter school movement. I have no regrets whatsoever. All of the experience I gained in the human rights struggle was applicable to this new frontier of human rights. In my most reflective moments, I believe this is where Dr. King would be if he were still alive! In the charter school movement, I am continuing the work of Dr. King that has far-reaching meaning. Every American child is deserving of a quality public school education. It is education that will guarantee that segregation and second-class citizenship will never return! Author, theologian, cultural historian, former chief of staff to Dr. Martin Luther King Jr.
Read the full foreword here. 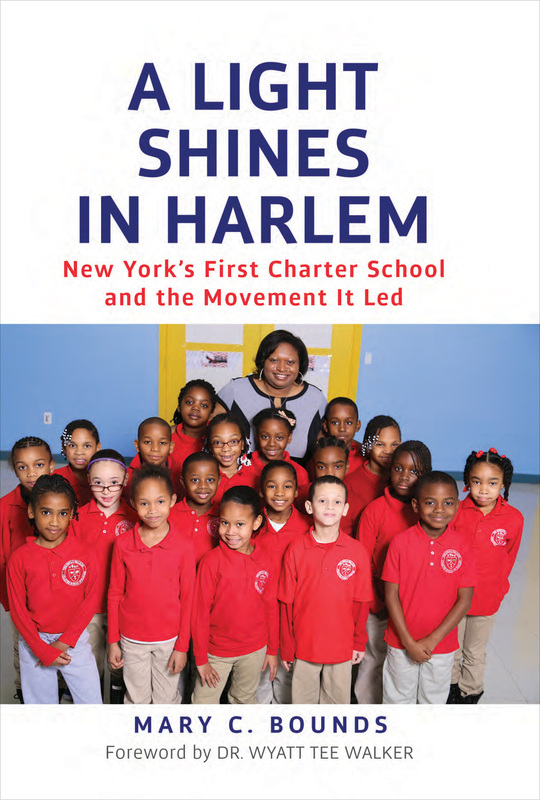 Order the book, A Light Shines in Harlem, in paperback or as an e-book here. In June 2016, Dr. Walker was awarded the Charter Schools Lifetime Achievement Award by the National Alliance for Public Charter Schools. The honor had only been granted to one other person: former president Bill Clinton. The full video interview with Dr. Walker, exclusive to RealClearLife, can be viewed below. -“We Shall Overcome” performed by Bryan Pezzone courtesy of AIX Records.